well, I did it!! i went through my whole craft room and actually looked at everything i have and pulled it all together into organized and labeled bins and drawers and cubbies. the labeling is key, now i know at a glance what is where, it's an incredibly huge difference! i also set up some inspiration on the wall, makes me feel good. thanks to angela and the fiskateers for providing the motivation and deadline to do this! 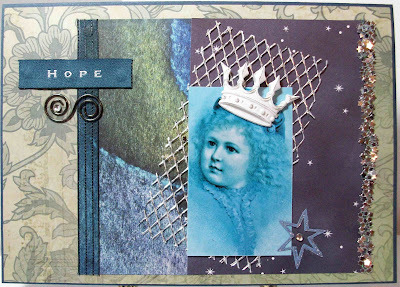 over at scrappy hours, the challenge this month was to create a card with stars. i chose a little girl image from the vintage moth...she hopes that her wish upon a star will come true. this was a collage of paper, ribbon, netting, a thick glue-line of glitter, and some fun little embellies! i recently joined the fiskateers and my friend angela, one of the lead fiskateers, issued a lofty challenge to all 5000 some-odd of us....to clean and organize our craft rooms by new year's eve. so here's my requisite video post of my craft room -- pre-challenge. it has been much messier, it has been much cleaner. what it definitely has not been is completely organized and inventoried. i have all the right shelves and containers and savvy to get it more organized, but i just haven't made the time. so now is the time! this is a 5x7x4-ish file box that I painted and embellished for my sisterish (that's our nickname for each other, she is my bro-in-law's long-term girlfriend) for xmas. i started with a ready-to-go blank board box and lined the inside and the bottom with fabric paper, sealing under and on top with mod podge. 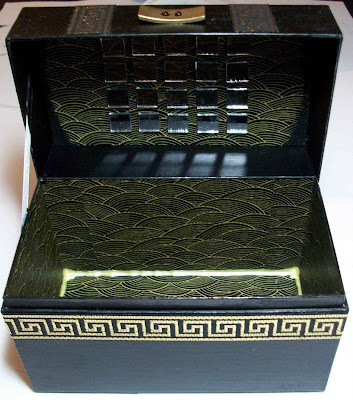 i added 3-d gold paint in the inside corners and glued little mirror tiles under the lid. then i painted the outside with 2 coats of black acrylic paint. i mod podged it and then painted a coat of pale ale memories mist to give it a little extra gloss, which also antiqued it a bit (can't see it in the pics so much). i wanted it to look like a real lacquered wood box - the blank board material held up so well with all those coats!! 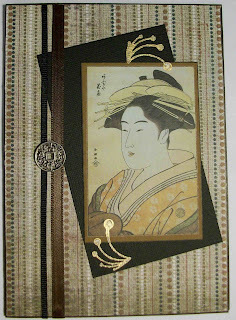 i rubbed the geisha transfer on the lid and accented it with glossy accents dimensional medium and gold acrylic paint. i glued on the ribbon and button handle, adding 2 little red beads in the button holes. this was really enjoyable to make, I'm having fun with acrylic paints and 3-D stuff...i entered this for mixed media monday's challenge of "what you liked doing in 2008"
i altered this little 3.5' round tin for my godmother for xmas. it had chocolates in it at one time, now it has become a home for fancy gold paperclips. 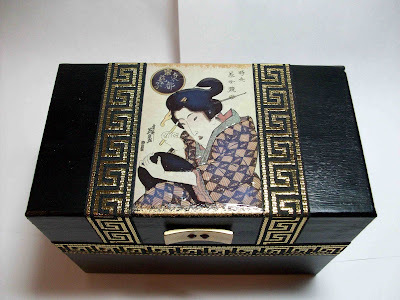 i painted the lid with black alcohol inks, decoupaged fabric paper on top, and glued ribbon around the side of the lid. the embellishment is a metal pendant and glass heart, with beaded accents. i added a decorative key on top of the heart, and dabbed gold acrylic paint around the top edge. 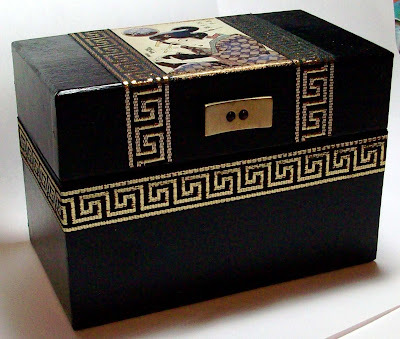 i really like the combination of gold and silver, and the 3-dimensionality of the lid. can't wait to make some more!! 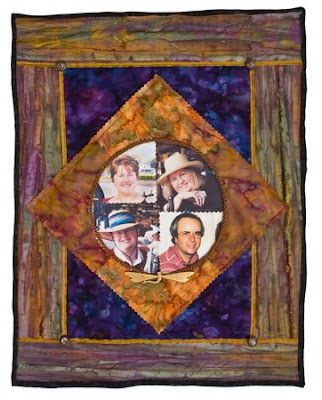 i made a family photo quilt for my mom for xmas - it's about 22x28, a wallhanging. i used batik fabrics and e.q. 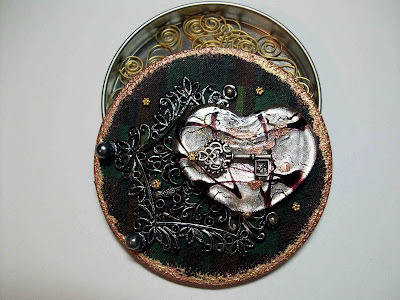 inkjet fabric sheets, and embellished with ribbon, cording, buttons and a metal dragonfly. it's a pattern from super simple quilts #3, coming out in june 2009...a great book for beginners, as are books #1 and #2.
this was fun and fairly quick to make (the hardest part was finding just the right photos), and even though i ended up with some wonky edges, i'm happy with how it turned out, and my mom (upper right) loved it! it's extra special because my father (lower right) died 20 years ago, but these pics make it seem as though he's still right here with us now! btw - if you ever need your quilt or other art professionally photographed, i highly recommend c&t photography services! 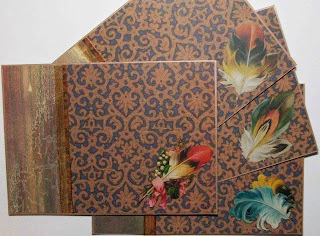 here's a quick giftie i just made...a set of four notecards with envelopes tucked in a matching paper portfolio. 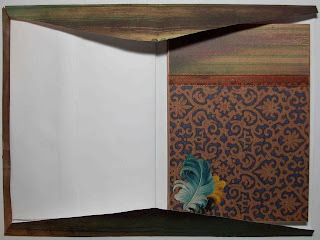 a really simple design, but i love the combination of these two papers, the feather rub-ons (dover publications makes the most beautiful rub-ons!) and ribbon. one of the perks of working for a craft book publisher are the craft camps that the employees put together in the office twice a year, in the summer and right before christmas. we all get the opportunity to step away from the computers and learn techniques and projects from some of our upcoming books. 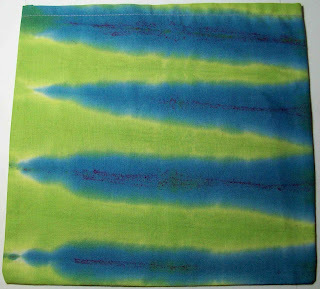 this month one of our holiday classes was on fabric dyeing...something i thought would surely be a pain in the keester, but it turned out to truly be fast, fun & easy, as the name of this book says! i started with a strip of 15" wide white muslin and folded it back and forth as if i was going to make it into a paper fan. then i folded it in half, just like you would for a fan. 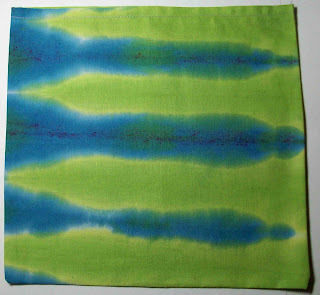 after mixing my dyes and pouring them into a flat pan, i dipped one side of my fan into the blue, and the other side into the green, letting the colors bleed towards each other into the middle. i had absolutely no idea how it would turn out, but when i unfolded it, i got this amazing zig-zag stripe! i made two little gift bags with it...i can't wait to try it again! 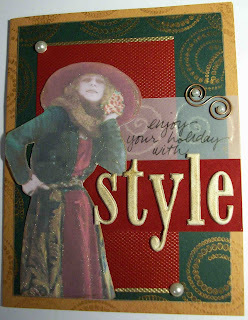 at daring cardmakers, the dare is to make super quick cards that don't look like they took only a short time to make. i made these two asian-inspired cards pretty darn quickly last night at a craft jam with some new friends. i intentionally packed light in terms of papers and embellishments because it was raining and i wasn't sure what the parking sitch would be...i think i work well under the conditions of limited supplies and good company! i recently bought some of these gorgeous designer papers at a great discount from a local scrapbooking store that is sadly going out of business. the geisha and the cherry blossom branch are rub-ons from dover publications - they have a wonderful selection. i used my trusty gold acrylic paint dabber with clear stamps to accent. i think these cards will make a lovely xmas gift! i have loads of links here for you that will lead you to some of the most unique ideas for papercrafts...you'll want to save this issue! enjoy! the next issue will be posted january 11th...the theme will be vintage art. happy holidays! 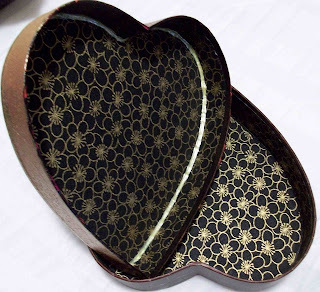 i took a pink heart-shaped candy box and inked all the edges black, covered the top and the inside with black and gold asian-themed fabric paper, and painted the sides and bottom with a metallic gold acrylic paint. on the top i glued some ornate gold foil stamped ornaments trimmed from an old xmas card. 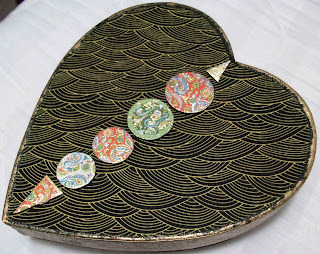 worked out nicely for challenges this week at pretty paper hearts and arty girlz too. i love fabric paper—michael miller fabrics stopped making it, but it's still available at some retailers. i also am enjoying the heck out of my acrylic paint dabbers, no muss no fuss. and they're super great with stamps! this was my first time making a shaker card, which was the challenge at ooh-la-la. I sliced off the top of a mini-shadowbox and added foam tape to trap glitter underneath. i really like all these colors too! there is a brand new papercraft challenge blog at ctpubblog.com and i am so excited about it - they're offering a terrific monthly prize package too! this month's challenge is a New Year's theme - make something to celebrate 2009 with any blank board product. i chose the 3" blocks and i made candleholders out of them for the living room. i went with rich earthy papers and kept the design simple. the 2009 numbers are on velcro, so the candleholders can easily be changed to a different theme with a new word or any kind of embellishments. 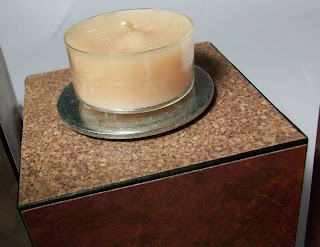 a new tealight candle can be pulled out of its plain metal tin and dropped into the acrylic holder when the old candle has burned down. - ink the edges of the blocks, unless you want white edges. i inked mine black with a paint marker. - trim squares of desired cardstock to 2-7/8". i chose 5 different papers, one for each side and one for both the top and bottom. 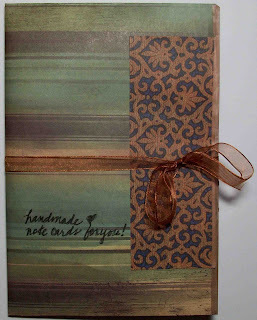 - adhere papers to all sides of each block with mod podge and let dry. 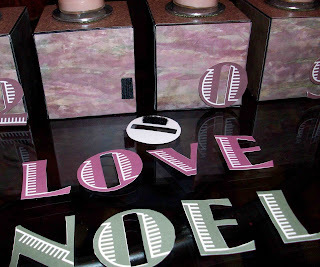 - coat all paper-covered sides and the edges with a thin layer of mod podge. - cut 1-7/8" circles from a thick felt, center and glue to the top of each cube. this gives a nice lift to the washers. - glue 2" metal washers on top of the felt (the felt and metal will also act as a protective barrier between the tealight and the paper). - adhere acrylic tealights on top of the washers. i used raised glue dots so the tealights "float" on top. great sketch at ismaki this week! i love tiled cards, and i am experimenting with my new fern glitter paper, clear stamps and acrylic paint dabber...inking the stamp with paint instead of a pad makes for a little smudginess, but lots more texture and deeper color. i love these little metal celtic flowers too, i added the pearl accent. the challenge at mixed media monday was to make a paper doll. of course i had to use fantastiques, the best paper dolls in the world! i covered the back of a wooden doorhanger with black frost fabric paper and painted the edges black. then i used my new favorite thing, an acrylic paint dabber in gold, to dab a distressed textured surface on the front. 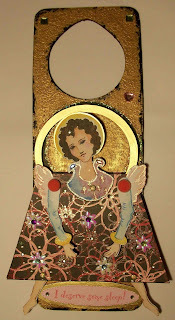 for the angel's torso, i used a little purse diecut that was the perfect shape for a gown and halo. the head and arms move on brads, and i embellished her gown with a glitter pen and rhinestones. i used a gold leafing pen on the halo and the border of the quote. this was so much fun to make! they say that your eyes are the windows to your soul...the challenge at big art adventure is to make something with a window. 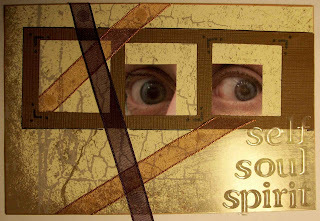 I snapped a pic of my own eyes and put together a 4x6 art postcard that gets me thinking about my self, my soul and my spirit. 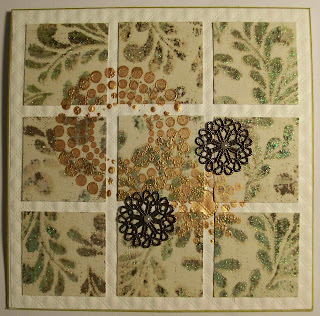 at daring cardmakers, the idea was to find a design element in your home that you like, and make a card using it somehow. 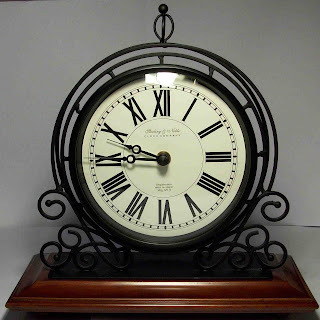 i love my mantel clock, it's black wrought iron on top of a mahogany color wood, with scroll flourishes. so i incorporated black, mahagony, and scrolls to make this card to congratulate some dear friends who just got married last month. popped it in the mail today! this one follows a sketch challenge at beary box. the santa is from a recycled card. at daring cardmakers, the challenge was to make a white christmas card with just a touch of pink. i always trim down 8.5x11 white cardstock for my 5x7 cards, so i end up with a huge pile of white strips, which of course i cannot bring myself to toss. then i thought of weaving them together - it's the perfect amount of texture for a plain white card. i plotted the weaving on pink cardstock that peeks just a tiny bit around the borders and used minimal embellishments, just clear plastic snowflakes and some pink metallic hearts. simple but elegant! this week at scrappy hours, the challenge was to do something using a christmas song theme, but without using typical red and green christmas colors. i'm in a brown phase lately - love combining brown with other colors. the forest scene is recycled from an old card. the theme open for interpretation this week at inspire me was "table". i made a postcard collage using the table of elements, the five elements according to chinese philosophy (metal, earth, wood, water, fire) and the chinese symbol for harmony. being in harmony with the world around us does seem elementary. over at this thursday, the challenge was to use lime, pink and chocolate colors together. great combo, and i added some blue too. it was so much fun, i made a set of 4 cards and put them up for sale on my etsy. i made this 8.5x11 collage for two challenges and it will be a christmas gift for my godmother. awfully big art adventure is looking for angels, and art creations friday provided a hand-painted background to incorporate into any piece. i tweaked the color of the background to be more goldy-rusty. i found a vintage lady in just the right pose on the internet, tweaked her coloring a bit too. her wing and gown is made from a variety of papers - handmade, translucent, and foil. the holographic foil in her gown is bronze, but the lighting turned it rainbow when i photographed it. i added gold mesh netting from the fabric store over the top. in the picture frame she is carrying is a detail from a painting called "spring" that i love, it's at the getty museum. i used anise seeds for the stars in the corner. really fun to make! welcome to the 3rd dimension! i have some great inspiration for you to bust out of the flat paper zone. let's start with ready-to-go blank board mini shadow boxes...these are so much fun to fill and decorate. i chose to make "travel boxes" - each one will celebrate a place i visited. this one is for paris—my mother and i had a wonderful time there several years ago. 1. line the inside with paper or photos. my side walls are covered with a sliced up aerial photo of paris that i took from the top of the eiffel tower. my back wall is a little fleur-de-lys die-cut with a picture of a statue of joan of arc inside...the statue was right around the corner from our hotel. 2. choose some charms and/or cut-outs to adhere in front of the back wall. i chose a lamp post from a picture i took in the park at the base of the eiffel tower, and a metal charm of...well, you get the idea. 3. decorate the outside. i distressed mine with black, blue and bronze inks and a couple different rubber stamps. 4. print out the name of the place you visited on translucent paper and adhere to the inside of the window. i plan to make a bunch more for other trips i have taken to mexico, alaska, hawaii, puerto rico, jamaica...they'll look so cute lined up on a shelf or windowsill, or even hanging in a mobile. click here for a gallery of beautiful design ideas for these boxes. and now for some wonderful submissions i received and some terrific posts i found! • carli made this adorable photo cube for her kids - so creative and interactive too. • patricia posted this great ornament design ...i remember making these as a child, can't wait to make them again! • tamara shares instructions for how to make an ingenious box card to hold a greeting and a surprise. • angela made a gorgeous poinsettia ornament and card by cutting and layering. • over at little house in the suburbs, you can learn how to make your own beautifully textured handmade paper from the stems of an okra plant. • for tons of family friendly 3-d craft projects - check out jolly mom! she hosts "make something monday" which challenges you to make a fun new craft each week. issue #4 will be posted on december 12th. 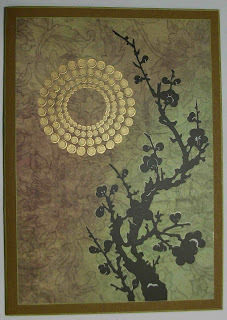 it will showcase the best of 2008 - what were your most creative papercrafting projects this year? email me with your ideas and submissions! in describing his agnosticism, albert einstein uses the term "vivid consciousness" which i really relate to. it's a wonderfully descriptive pair of words when thinking of science and humanity, as well as art and religion. this is my first experience with a blog called inspire me thursday. the challenge was to use an albert einstein quote as inspiration for a piece of art. i love blurring the lines between arts and crafts, in fact, i have decided that my new year's resolution for 09 will be to identify as both an artist and a crafter. both have merit in terms of creative expression. each element in this postcard has symbolism for me, right down to the glue dots that adhere the translucent circles to the foundation. it was great fun to create! it's santa time at theme thursday...the vertical strips in this collage are recycled from old christmas cards. i added sparkly holly leaves and a snowflake with my trusty glitter pen. i love this old-fashioned santa! this week's challenge at one powerful hour was to use inchies in a larger piece of work. i know inchies are a big deal right now, but i never thought i'd have the patience to do collage work on such a small scale - i'm not into moo cards either for the same reason. but then it hit me (rather like a 2x4)....oooohhh, just make a larger collage and then cut it up into one inch squares, d'oh! you still have to work with small pieces, but i can deal much easier with the concept now that i stepped outside the inchie box. so i had this scrappy little needlefelted piece that i was doodling with while working a trade show a while back, where i was demonstrating just how easy needlefelting is. I cut two inchies from it and used them in this postcard, which will be my little reminder as i continue to try new things outside my comfort zone! i found a new challenge blog in the netherlands - art creations friday - i need another challenge blog like a hole in the head, but this is their first post and folks seem to be excited about it. they gave a photo that we all had to use in some way. she's a pretty one! at one powerful hour, the challenge was to make something with stuff that would've been destined for the trash. i did a postcard with small paper scraps, a short piece of leftover string, and a little metal buckly thing that was at the bottom of my toolbox, no telling what it belonged to. 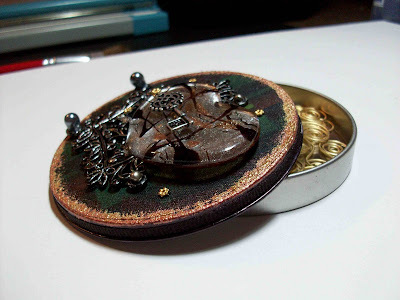 i added a charm and some stamping in brown and bronze. the center tiles remind me of the night sky. 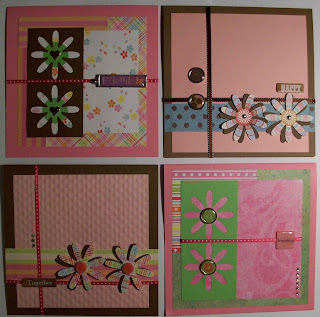 the challenge at spoonful of sugar was to use flowers in a card, plus you have to use a rubber stamp image. since i am hooked on the 4x6 postcard format, i made one with some dark floral and scrolly papers to tile together, with a flower silhouette stamped in silver ink. in tarot, the joker card is the fool...symbolized by feathers and an 8-spoked wheel. sunday postcard art has a joker theme this week, and while batman and poker decks are what folks tend to think of first, myself included....i opted for a slightly different take. i have made 4 art postcards so far....they are so much fun! theme thursday is all about the wild west this week. i did a 4x6 postcard paper collage with a pic of a western pin-up girl, i even burned the edges - fun! what was that 80's song, it was funky and monotone...."i wanna be a cowgirl, so you can be my cowboy - yippie ki-yay yippie ki-yo..."
we needed 20 thank-you cards for a group of sales reps at work, so two of us did 10 each, using fantastiques characters, velvet papers and ribbon. i just distressed the edges with chalk inks and adhered it all down. the little brads allow some of the arms and legs to move. it was fun to have a crafty work assignment! all 10 cards can be seen on my flickr page. 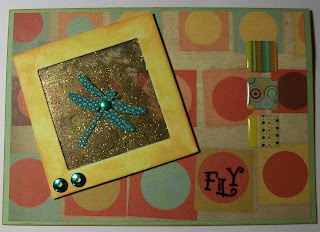 these are stampin' up silhouette stamps with color box chalk inks that i used for the challenge at our creative corner. pale blue and brown together seems to be quite the color trend these days, i see it everywhere in paper and fabric. this little quickie for the ccayr blog had to follow tamara's design layout of 3 rectangles and a circle layered like this. the stocking comes from a recycled card, and my little snowflake spins around on the brad. i also used a glitter pen to highlight the stocking and all its stuff. love it!